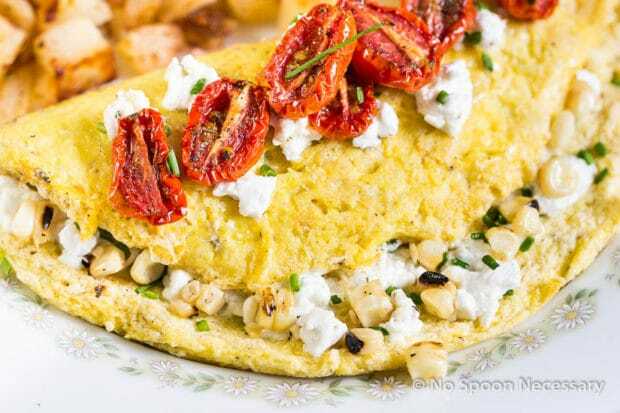 Fluffy omelettes packed with corn, goat cheese, chives, and topped with sweet slow roasted tomatoes. How was everyone’s Labor Day weekend? Mine was like a chapter from a Bill and Ted Adventure – most excellent! Lots of great food (if you follow me on Instagram, you know this involved live lobsters), even better company, and tons of laughter. The weekend was just an overall kick arse, family fun filled time. If your weekend was a quarter as enjoyable as mine, I know you had a stellar time. Sooo, I totally understand that with this weekend came the “official” end of summer… but, I am SO going to be THAT girl. Your pumpkin lovin’ self, that is already sprinkling cinnamon on ALL the things possible, may snub your nose at me. However, for at least another week (or so), I am STILL clinging for dear life onto my grill, farmed corn and tantalizing, market fresh, tomatoes (FYI- corn and tomatoes are still in season). Someone may need to pry my fingers away from my grill brush and wipe my tears when the farmers market is no longer an option. If seriously fluffy, super moist Omelettes are your jam, this method is where it is at! The key to making these egg-cellent, breakfast (brunch or brinner) beauties fluff-tastic? Separately whipping the egg whites until soft peaks almost form, then folding those into the yolks. But, since I am a summa-lovin’ freak of culinary nature, I HAD to add grilled corn TO the actual omelette… AND to the inside filling. Obviously, I could have stopped there… but, if you follow this blog, you know I never do that (I have over-achiever syndrome). 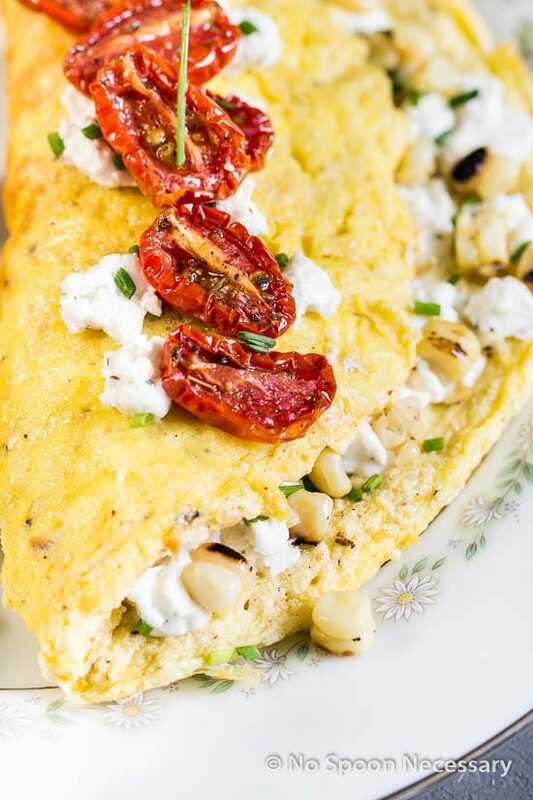 So, I decided to bring some of my favorite corn pairings to the omelette party – goat cheese and chives. #YES! The resulting Omelettes are moist, tangy, creamy, herbaceous, corn-errific, and absolutely delicious. And, you could totally stop there, with just the fresh and fabulous omelette. 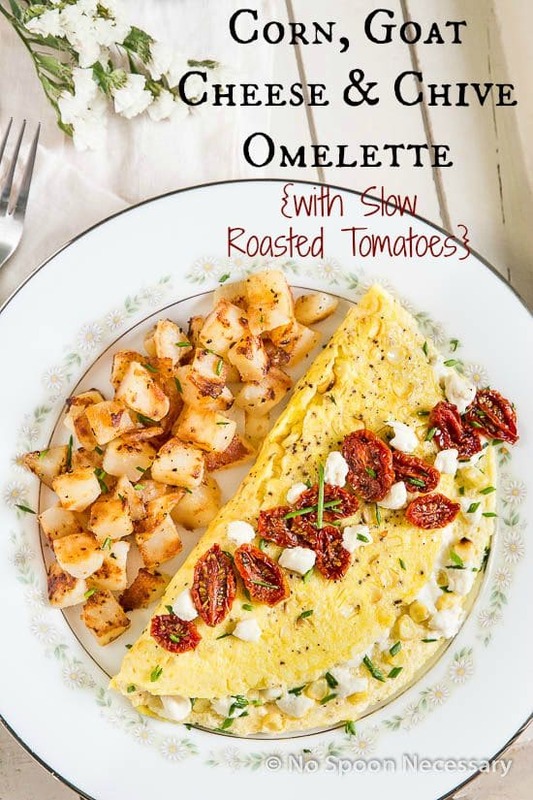 Or, you could give your omelette a scrumptious topping in the form of slow roasted tomatoes. Needless to say, I highly suggest gussying up your eggs. Always. Slow roasted cherry, or grape, tomatoes are addictively delicious. They taste like healthy caramelized candy that you just want to PopPopPop into your mouth, one handful after another. Plus, they are seriously versatile, so you should go ahead and make triple the amount (I do!). You can stir them into pasta, toss them in salads, serve them with chicken or fish, turn them into salsa, or just shove them on repeat into your pie hole and smile. All of those are perfectly acceptable methods of slow roasted tomato consumption. For the Slow Roasted Tomatoes: Preheat the oven to 225 degrees F. Line a large sheet pan with aluminum foil for easy clean up. Grill the Corn: Heat a grill, or grill pan to medium high- high. Grill corn, turning occasionally, until charred and tender, about 10-15 minutes. Transfer corn to a clean work surface. Brush with butter and season generously with salt and pepper. When corn is cool enough to handle, remove kernels from cob using a serrated knife. Set aside. 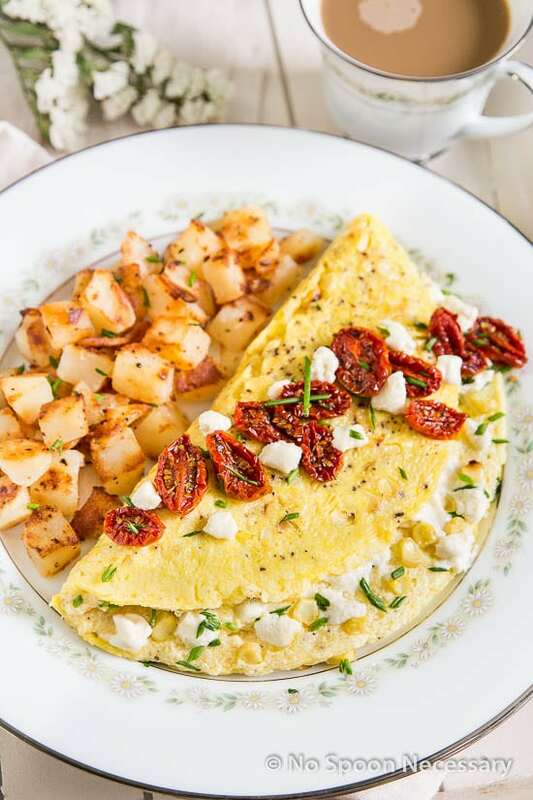 For the Omelets: On a clean work surface of plate, divide the goat cheese and chives into thirds. Set aside 1/3 of each for topping omelets. In a large mixing bowl combine the egg yolks, corn, half and half, measured salt and pepper. Whisk to combine. Place the egg whites in a separate, medium mixing bowl. Use a hand held mixer, on medium speed, to beat the egg whites until SOFT peaks ALMOST form. Use a rubber spatula to gently fold the egg whites into the yolk mixture. Fold until thoroughly combined and no traces of whites are visible. Melt 1 tablespoon of the butter in a nonstick skillet over medium heat. Add half of the egg mixture to the pan. Cook, undisturbed, until the eggs just begin to set, about 2 minutes. Use a spatula to gently lift the edge of the omelet to allow the uncooked egg to flow underneath. Continue to cook, undisturbed, until the eggs are ALMOST completely set. Sprinkle half of each the goat cheese and the chives (Optional: and reserved corn) over HALF of the omelet. 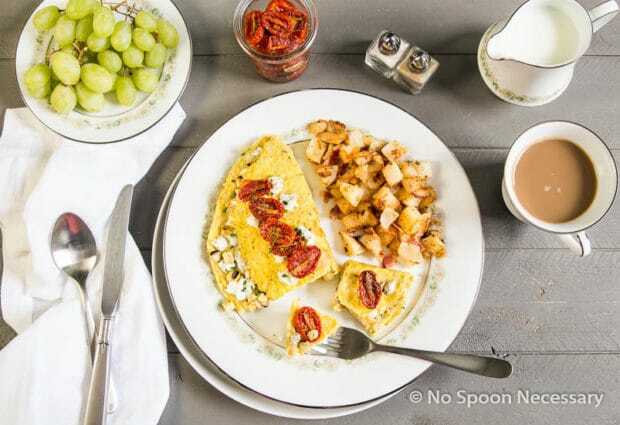 Use the spatula to gently fold the bare half of the omelet over the topped side. Continue to cook until set, about 1 additional minute. Remove from heat and tilt omelet out of skillet and onto plate. Repeat with the remaining butter, eggs, goat cheese and chives. 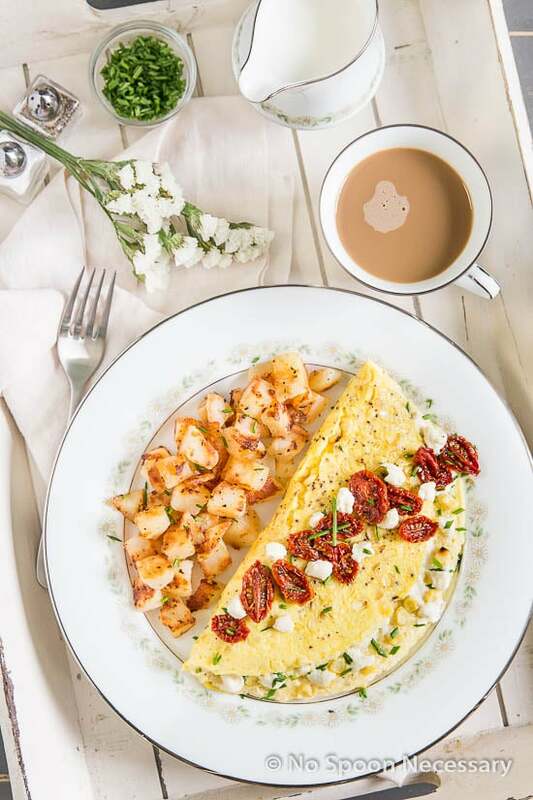 To Serve: Garnish omelets with the slow roasted tomatoes and the remaining goat cheese and chives. Enjoy! *Tomatoes will keep, covered and stored in the refrigerator, for up to 1 week. I like to triple the recipe and use the tomatoes in salad, on crostini, in bruschetta, or simply on their own! *If the tops of omelets are still wet, but bottom is beginning to brown, before adding toppings, transfer sauté pan to the oven with the broil function on, for about 30 seconds to 1 minute. Then return to stove, top with goat cheese and chives and continue as directed. Just make sure your sauté pan is oven safe! *Optional: Reserve 2 tablespoons of grilled corn for the filing. Add one tablespoon, per omelette, to the filling with the goat cheese and chives. I totally thought I commented on this one but I guess I didn’t! I am all about goat cheese, chives, and slow roasted tomatoes. 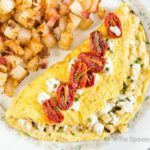 All together in an omelette sounds like perfection! Also, Labor Day already seems like it was soooooo long ago! Is it time for Columbus Day yet??? Pinned!